Bud Ransomware is yet another dangerous threat that you wish to nip in the bud but it is practically impossible as this ransomware can stay under the radar as long as it encrypts all your important files. It only reveals itself when it is done with the damage and wants you to know about it so that it can extort the usual ransom fee from you. Although paying this money may look like your only option to be able recover your files and use your computer again, we must warn you that this ransomware may be still in development stage and the decryption procedure may not fully work, if at all. And then, there is the issue with the fact that you are dealing with cyber criminals here, which means that you can never trust their word. So, if you do not have a backup that you have saved recently, there is a good chance that you will have to say goodbye to your files after this malicious attack. We highly recommend that you remove Bud Ransomware from your PC because there is no other way to make it safe again even if this would mean the loss of your files. Of course, considering the severity of this attack, it is really up to you how you proceed. Our tests and research show that these cyber criminals may use two approaches to spread this ransomware on the net. First, it is possible that you are attacked due to remote desk protocol configuration weaknesses. In other words, if there is remote desktop software (e.g., TeamViewer) installed on your computer, these crooks may be able to gain access to your system without your knowledge. It is possible that your password is a weak one or there are other holes in security because of unsafe configurations. Once there are in, these crooks can install this vicious program and attack your system behind your back. Therefore, it is essential that when using such remote desktop software, you set it up properly and securely. It is also advisable to protect your system from similar dangerous attack by installing a reliable anti-malware program. Another widely used method is spamming campaigns in which this dangerous infection can be spread as an attached file. This attachment may be disguised as an image or text document to trick the potential victim. However, in reality, this is the malicious executable file, which will initiate the attack the moment you choose to open it. This is why it is important if you are in doubt about the authenticity of a mail or the relevance of it that you try to find out whether it was sent to you personally or it may have come from a fake sender. This spam can be very misleading and convincing so that you would want to open it even when you find it in your spam folder. This mail can claim to be about any important-looking matter, such as unpaid invoices, suspicious transactions on your bank account, wrong credit card details, and more. It is quite possible that your curiosity would win over and you would want to see the contents of this mail even if you do not feel related. Please note that opening the attached file would mean that even if you manage to delete Bud Ransomware entirely from your system, your files will remain encrypted. This ransomware infection is written in C++ and uses the AES encryption algorithm to encrypt your most important personal files, including your photos, videos, documents, databases, and archives. 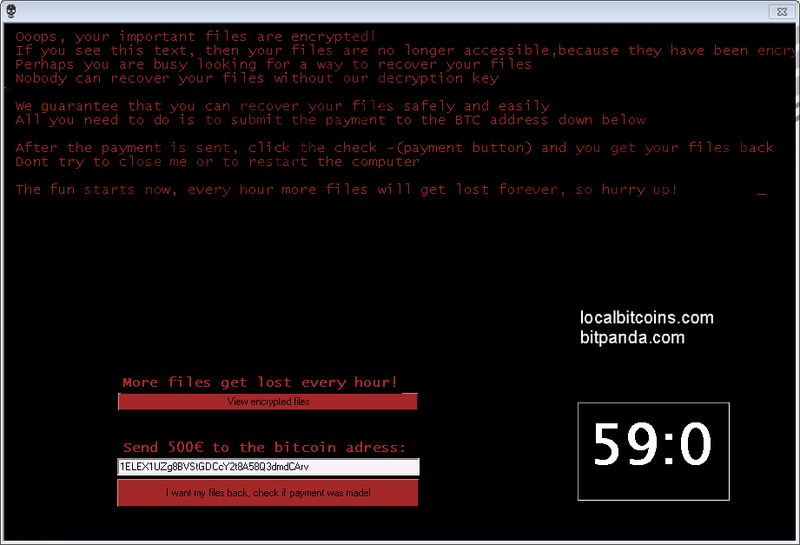 In fact, this threat looks very similar to Jigsaw Ransomware. Before execution, this malicious program copies itself to "%LOCALAPPDATA%\Corel\CorelCGS.exe," which is the executable to encrypt your files and creates another copy in "%APPDATA%\Corel\RegisterCGS.exe" that is not active but serves as point of execution in the "HKCU\Software\Microsoft\Windows\CurrentVersion\Run\RegisterCGS.exe" Windows registry value name. The affected files get a ".bud" extension, which makes it easier for you to identify your attacker. Once the encryption is done, this infection opens its application window on your screen and starts typing out the ransom note. This note informs you that there is no way for you to recover your files unless you send 500 EUR worth of Bitcoins to the given wallet address. Every hour some of your encrypted files get deleted to push you to transfer the money as soon as possible. However, there is no guarantee at all that you will get the decryption key. We believe that it is always risky to pay to criminals, not to mention that it means supporting cybercrime. We advise you to remove Bud Ransomware right away. It is important that you do not try to restart your computer because in that case this ransomware blocks your Task Manager and disables your main system process, explorer.exe, which would make it necessary for you to restart your PC in Safe Mode to be able to remove it. If you have not rebooted, you can open your Task Manager to kill the malicious process so that you can delete the related files and registry value name. Please follow our instructions below this article if you want to end this dangerous threat manually. In order to protect your computer from future malicious attacks we recommend that you install a reliable anti-malware program like SpyHunter. Select the malicious process from the list. Delete the malicious executable you may have downloaded recently. Check your default download folders for suspicious files. Press Win+R and type regedit. Press the Enter key. Locate and delete "HKCU\Software\Microsoft\Windows\CurrentVersion\Run\RegisterCGS.exe" registry value name. Quick & tested solution for Bud Ransomware removal.